HONGZHI Period 1488 - 1505, Ming Dynasty. 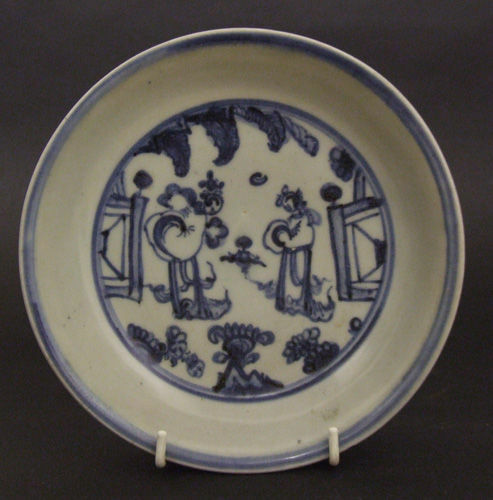 A Hongzhi Ming Blue and White Porcelain Dish. Decorated with Two Ladies Between Fences with Banana Leaves Over Their Heads. The Back with Scrolling Lotus. Provenance : The Loose Family Collection of South East Asian Ceramics. Formed by Reidun and Ivar Loose and partly exhibited at Verstlandske Kunstindustrimuseum, Bergen, Norway and at The Rohsska Museum, Gothenberg Sweden, 1973. Formed in Djakarta between the late 1950's and 1970. Commentaires sur HONGZHI Period 1488 - 1505, Ming Dynasty.